Coll. No. 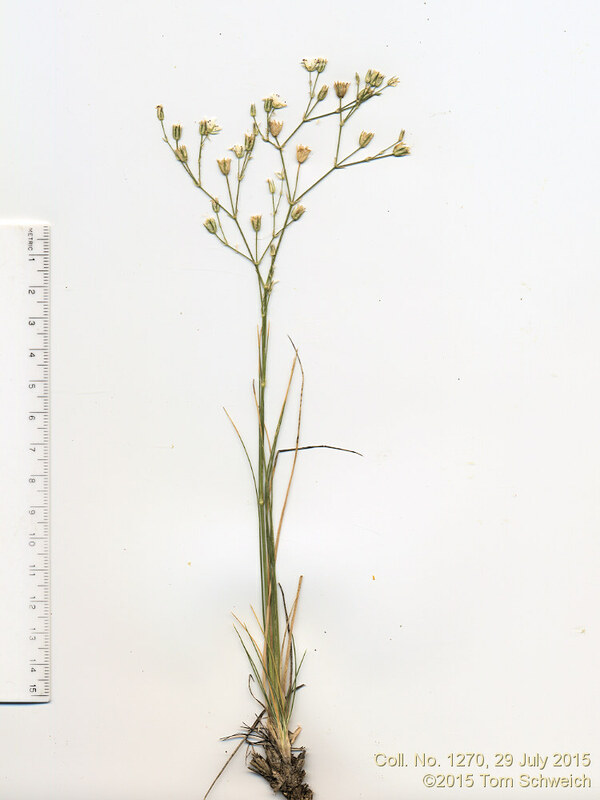 1270, 29 Jul 2015, characters observed: Perennial herb, tufted, to 30 cm. ; Stem, proximal glabrous, distal short glandular hairy “peg-like hairs”; Leaves, cauline, 50 mm. × 0.5 mm. wide, linear to needle-like, erect to appressed, tip small spinulose, stipules absent; Inflorescence, open cyme; Pedicels, 3-8 mm. ; Sepals, distinct, 4.5 mm., glandular hairy; Petals, entire; Anthers, purple. Field Notes: Coll. No. 1270, 29 Jul 2015. Other photos about Species or Caryophyllaceae Eremogene fendleri.